There’s nothing like having a food blog to motivate you to make something new. Add to that my promise to make my own mocha roca two weeks ago and I had to deliver. Originally inspired by leftover ingredients from my 2006 candymaking marathon and Brown & Haley’s Mocha Roca, I searched for a coffee toffee recipe online without much luck. Other candies I make with coffee flavor utilize espresso powder, so I figured it made sense to use some here, too. I noticed some coffee flavored candies also use real coffee or espresso, so after a trip to Starbucks for a couple shots, I was ready. On my web search, I did come across Shaymee’s Dark Chocolate Espresso Toffee, which had no almond coating but was covered in milk chocolate stripes, similar to decorations I do for dipped caramels and truffles. Given that part of the reason I was making toffee was that I had leftover chopped almonds from the holidays, I compromised and only coated one side of the toffee with almonds. I think the bare chocolate side with stripes looks pretty dressy and easily differentiates this toffee from regular English Toffee. When you first bite into one of these toffees, the coffee flavor comes on fast and strong, but quickly fades and is overtaken by the buttery toffee flavor. I’d personally like the coffee flavor to linger for a while—a sentiment echoed by several tasters—but I’m not sure exactly how to achieve that goal. Perhaps a liqueur or some other coffee flavoring would prolong the flavor—I’m open to ideas! I’m definitely planning on adding these to my holiday candymaking. 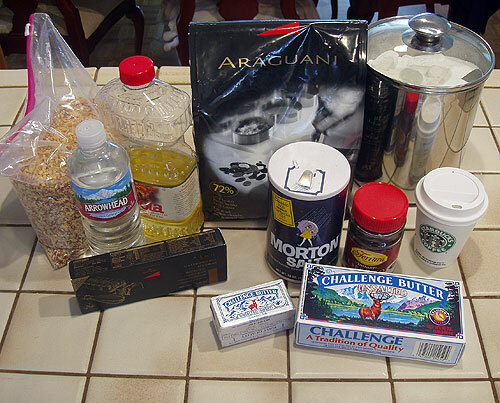 Ingredients for making Coffee English Toffee. Pour in espresso shots before adding espresso powder. 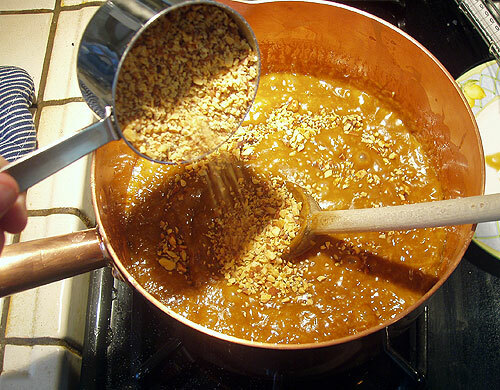 Once mixture reaches 260° F, add 1 cup chopped almonds and stir constantly until 305° F.
Score toffee repeatedly while hot. Once cool it can be easily broken along score lines. Remove excess chocolate by scraping or bobbing. 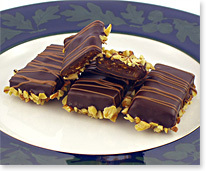 Carefully and quickly drizzle tempered milk chocolate over exposed chocolate sides of toffees. I brought most of these into work and delivered them to nearly 30 people, most of whom had never had toffee that was less than 24 hours old. They were a hit and I had several people wandering by my cube later in the day to see if there were any left. 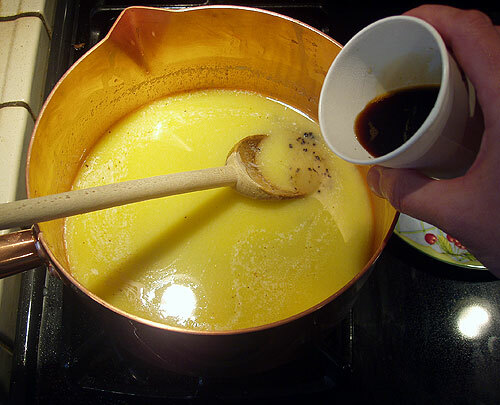 The recipe, with detailed instructions and complete photo gallery, can be found on the Coffee English Toffee recipe page. This entry was posted on Tuesday, February 6th, 2007 at 11:08 pm	and is filed under Candymaking. You can follow any responses to this entry through the RSS 2.0 feed. You can leave a response, or trackback from your own site. It all look gorgeous. I notice the marble. How did you start collecting your confectionary supplies? What sort of chocolate mixer is that? Hi Jeanna, I started gathering equipment about ten years ago. I read about chocolate tempering and the cookbook I had mentioned the marble slab technique, so I went out in search of a suitable marble slab. This turned out to be a challenge, and I think it still is. I ended up finding the one you see in the photos at Macy’s with a matching rolling pin. 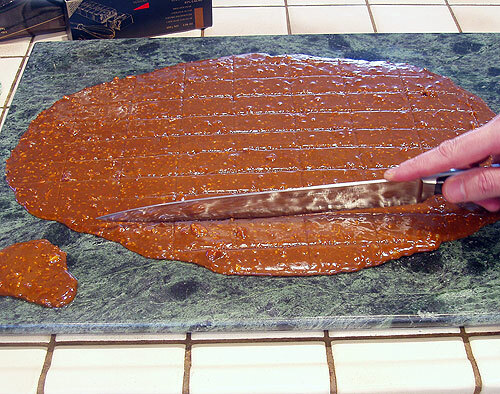 The rolling pin was supposed to be good for rolling out toffee, but after a couple years rolling, I wasn’t happy with the results, which often left blisters of buttery oils, so I started tilting the slab at steep angles to spread the toffee with better results and less mess. See the marble slab page for some more information. I like this slab because it is not too thick—it’s about 3/8 of an inch thick. I’ve seen some that are 3/4 inch thick, but they were not as long or wide. 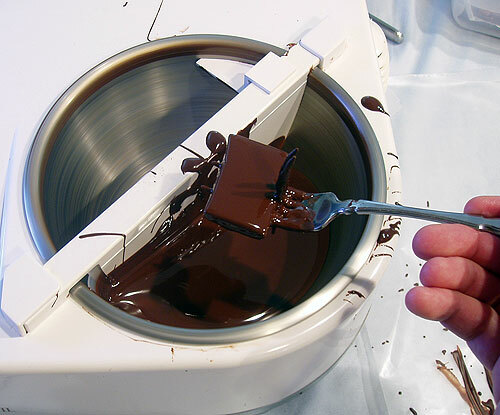 My tempering machine is a Chocolate Sinsation II by Chandre (no longer made, but the equivalent is available at Chocovision. After tempering with the marble slab twice, and another couple times with the standard seed method, I was thrilled to find there was an easier way that would free me up to do other things besides monitor and regulate the temperature of chocolate. It’s priced similar to a really high end KitchenAid, but it seems to be holding up fine after 10 years. That sounds like invaluable equipment. 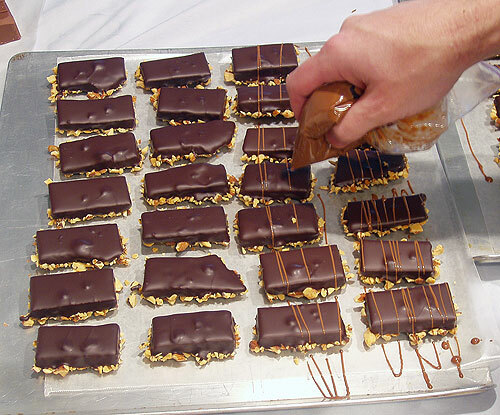 I’ve seen them use marble slabs at a local chocolate factory, but never heard of a tempering machine. Thanks for the links and info.